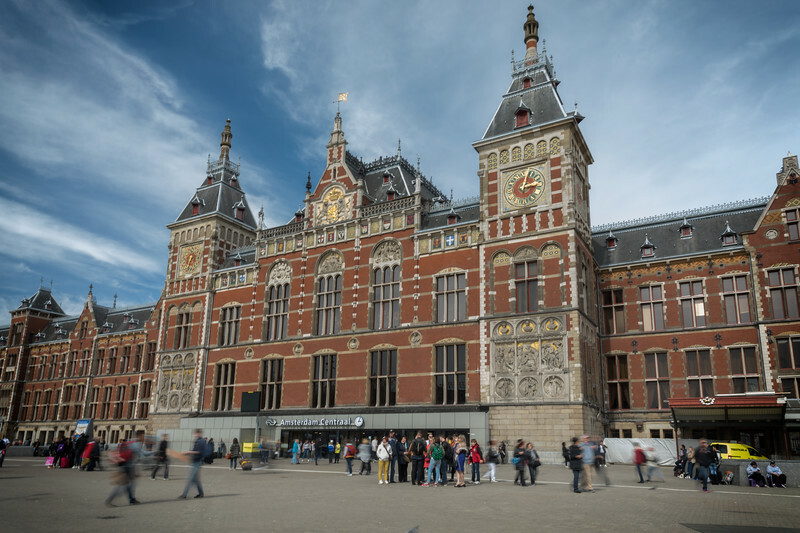 I was quite excited to travel to the Netherlands and planned to photograph several locations. The people, culture, and medieval charm were delightful. This collection of images now holds both aesthetic and sentimental value. Viewing a map, it appears the entire city of Amsterdam is laid out in relation to Centraal Station. The majestic design of this Neo-Renaisance building makes a bold statement. Indeed, it created a wave of controversy when it opened in 1889. The Dutch government overturned Municipality planners and decided to block boat traffic to the IJ lake by sinking 8067 wooden piles to create three islands upon which the station sits. Petrus J. H. Cuypers constructed the building. He also built the Rijksmuseum, another impressive Amsterdam structure. Over 250,000 people keep it constantly buzzing each day, connecting between trains, subways, electric street cars, busses and boats. Public transportation runs so smoothly here. If you are interested in visiting or photographing these sites, click on the info icon and use the map feature. In this image, I'm using ISO 100, but for most othes the Canon 5D mIV allowed me to stop action on bikes and boats with high ISOs and low noise.